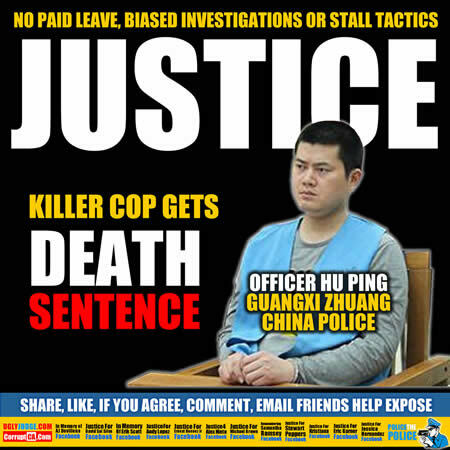 In China when you kill someone even if you’re a police officer you can be sentenced to death. America needs change, our courts stopped serving justice decades ago when dishonest lawyers took over. Dishonest, unethical, greedy lawyers who became judges who have no business being on a bench. Justice begins in our courts and when Police officers commit crimes and are not held personally accountable and punished people lose respect for law. Police and judges depend on each other thus they’re biased and lack the ability to make objective decisions when ruling over crimes by police. The same problem exists when judges commit crimes, police fail to investigate or uphold the law against a judge. Often victims are abused and terrorized to stop them from reporting dishonest police or judges in America. Police officer Hu Ping was ordered to pay the victim’s family 73,324 yuan ($13,380), according to the Guigang Intermediate People’s Court in the southern region of Guangxi. The case sparked outrage among China’s internet users after it was first reported in October. Which is what is happening in America today, people are outraged by the lack of respect Police officers have for law. The constant cowardly use of “I feared for my life” is used to cover up murder. According to the Shanghai Daily, the pregnant woman, Wu Ying, and her husband Cai Shiyong were tending to their rice-noodle store when Police officer Hu Ping, drunk and shirtless, entered and demanded milk tea. After the woman responded that the store did not serve milk tea, Officer Hu Ping opened fire, wounding Cai in the shoulder and killing Wu and her unborn child. Stories of abuses involving police and “chengguan”, or urban management officers, regularly trigger outcries in China. In one of the highest-profile examples, four chengguan in the central province of Hunan were sentenced in December to between three and a half and 11 years’ jail over a dispute that left a roadside watermelon vendor dead. Local media reported that the officers beat the vendor to death for operating without a licence, with one smashing his head with a metal measuring weight. 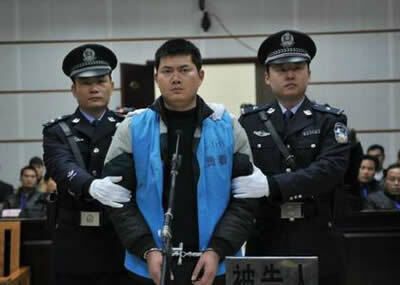 In 2009, a police officer in southwest China’s Yunnan province was sentenced to death for killing a man in an argument, although the sentence was later commuted. Chengguan, who are tasked with enforcing local government regulations, have gained particular notoriety among the Chinese public for abusing their power.